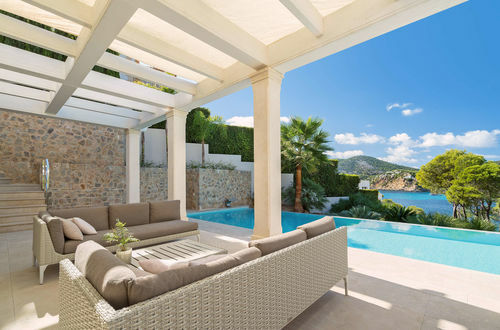 This exquisitely refurbished luxury villa is situated in one of the best locations of Port Andratx within walking distance to the port. It offers a stunning view over the harbor and the sea. 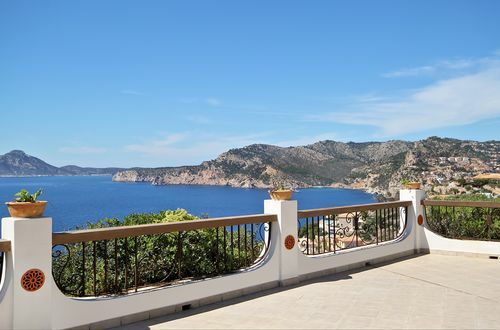 The villa of about 360m2 with spacious terraces of approx. 200m2 is set on a large plot of approx. 1.502m2. The entrance level consists of a bright living and dining area with fireplace and an open plan, fully equipped luxury kitchen as well as a bedroom with en suite bathroom and private entrance. The master bedroom comes with an elegant private bathroom and a dressing area and two further bedrooms each with bathroom en suite. The basement includes a large double garage with electric gate and storage rooms. The captivating outdoor area offers various sunny and shady terraces, a neat Mediterranean garden and a beautiful swimming pool. Obviously this unique villa comes with other first-class features such as modern home technology, double glazing, central heating, underfloor heating, air conditioning w/c, video intercom, alarm system and automatic garden irrigation system. Port Andratx is a fascinating town in the south-west of Mallorca. The attractive harbor promenade offers a wide selection of exclusive restaurants, trendy bars, cafes and shops. The center of Palma is only a 20 minutes drive away.